So How Did It Go On Instagram In February? February means Spring is starting to arrive, but how did the month on Instagram compare to January? Let’s take a look at our Instagram growth and engagement. We’ve introduced a new grade card feature. We use our own judgement for three categories of metrics: growth, engagement and post types. The three areas are graded and then the platform receives a final, aggregate grade. 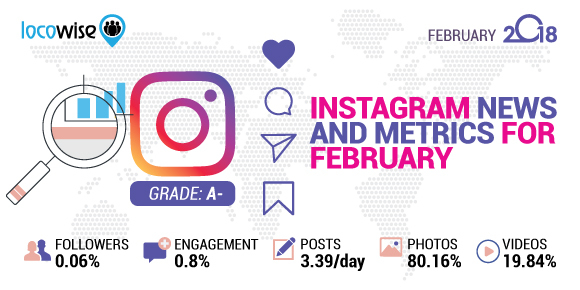 A large percentage, 80.16%, of the posts on Instagram in February were image posts. Compared to January’s 81.45% this was a letdown. The rest of the posts were video, at 19.84%, compared to January’s 18.55%. The number of followers across the platform grew by 0.06%, compared to the 0.05% in January. This was a slight growth, admittedly, but it’s a healthy one. Brands posted on Instagram 3.39 times per day in January, compared to the 3.27 times in January. This pushes this grade up on January. Videos on the platform engaged 0.8%, the same for three months in a row. Photo engagement improved, and was at 1.2% in February, against the 1.1% we found in January. 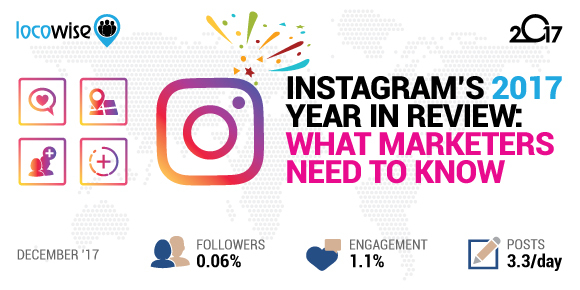 Instagram continues to be a hot topic for pretty much every brand that wants to get seen online. Things have been pretty busy over the last few weeks, with February 2018 giving us lots to talk about. We can get excited about Instagram on a daily basis. It has still got that cool feel and the ethos of fun that made it so appealing back when it first started out. But it’s possible that a couple of new as yet ‘secret’ features will blow the lid off that. In fact, if you look at the whole thing closely enough, you’ll note that if these new features actually happen, it could lead to Instagram becoming less than unique. It has been discovered that Instagram seems to be getting ready to unleash voice and video calling on its user base. There is, fundamentally, nothing wrong with this. However, we’re not exactly sure that users will want this kind of thing. There are a million different ways to make a voice call, and a video call, and adding one more platform to the list could turn some users off. It may not, of course, but if Instagram genuinely feels that these features would be useful to the audience then we think they’re more than a little off-track. Instagram isn’t exactly known for releasing new features every day of the week, so when it does pull something new out of the bag, it’s always worth sitting up and taking notice. Even when the new feature seems rather trivial. Principally of value for brands who are super-good at monitoring their accounts, the next time a user screenshots one of your posts, you will be notified. If we unpack that just a little bit, it does make perfect branding sense, and can provide some real value. But it does require a brand or its agency to really be on the ball. Monitoring has always been important, and this one is a really tricky one because you’re looking at a situation that requires you to be focused on the journey that the post takes. If you are able to check what is going on regularly (during a campaign, for example), you should be able to see this as one more sign of engagement. We think it will be a bit of a novelty for a while until people start to get used to it. Whatever people want to call it, Instagram has decided to test a new feature that will allow users to reshare content in their Stories. It’s a great idea, but it perhaps has been dampened a little by the fact that most people who use Instagram take screenshots of stuff they like anyway. The posts that you reshare (assuming the feature becomes a reality of course) have to be on a public feed. And this makes sense, because if a feed is public then it is pretty much seen as open to being shared. Basically, you’ll be able to click on ‘add post to your story’ (or whatever Instagram decides to call it) pretty soon. We think this is a winner if a rather obvious addition. That’s right, scheduling is coming to Instagram, and for real. One of the biggest ‘wants’ on the platform, at least in the case of brands, scheduling is now in Beta phase. This means that the whole thing could be real shortly, and to make it even more mouth-watering, it is offering the opportunity to schedule posts on third-party platforms. This is big news simply because it was a fiddly and awkward process before. Now, with much more fluidity involved it should be a whole lot easier to get the schedule done. We can see this being a very useful tool for brands, as long as it is easy to use. LIke most scheduling processes, the simpler it is, the better. We know it will be a huge thing for brands, so watch this space. And Instagram also said that the feature would be available for business accounts only, so far that is. The pain in the neck aspect of images on Stories is easing somewhat. Instagram announced they were going to make it easier for images to be squeezed into Stories without any of that pesky difficulty around the size and orientation of an image. This is good news for brands because it means that images of different sizes can be added. There’s a little fiddling to be done, but it looks like the platform is offering a little more support for the more creative brands out there. Now you can use type mode when creating content on Instagram. The best way to explain what this is means looking at your Facebook feed, or anything on Twitter, basically. It’s where you can create an image with type rather than, well, images. Used most often for those inspirational quotes that people seem to want to read, for a brand it might make sense for a launch, for example, where a quick message needs sending. It’s kind of cool, to be honest, and we think the range of colours available make it even more eye-catching than the type mode on other platforms. To get the best metrics (probably) available today, and some shiny graphs that will make your clients really happy, take out a seven-day free trial of Locowise.